Enterprises are quickly evolving with new network devices to improve communication and security. Power over Ethernet (PoE), a way to deliver electrical power over LAN cables to network devices, has been widely deployed to provide power to various endpoints in the enterprise environments. 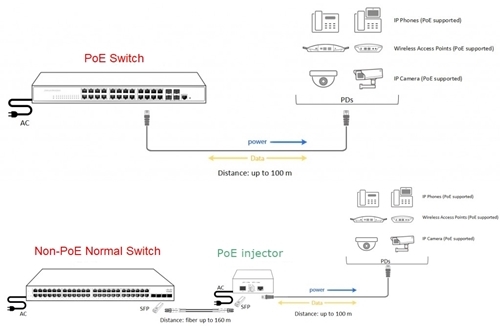 If you want to upgrade you network to PoE, one way is to deploy a PoE switch. This paper will provide an overview of the PoE technology and PoE switches. What Is a PoE in Networking? Power over Ethernet, also known as PoE, is a networking feature defined by the IEEE 802.3af and 802.3at standards. 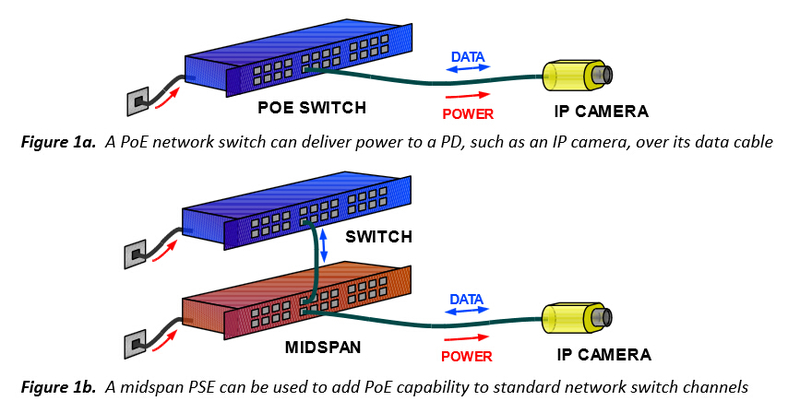 PoE is able to combine the two connections into one Ethernet cable so that single network cable will transmit both data and 25W of electricity. By this way, it can minimize the number of wires when installing the network, which realize the lower cost, less downtime, easier maintenance, and greater installation flexibility in networking. 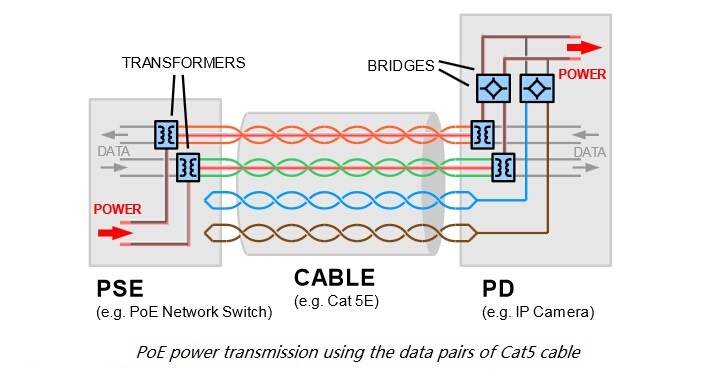 Because PoE is allowed to use one cable for both power and data transmission, PoE can save money on purchasing and running cable for networking equipment. It can brings many advantages to the network as follows. Network cables do not require a qualified electrician to install them, and can be located anywhere, so PoE eliminates the time and cost of hiring professional electrical installers. Network administrators can deploy devices (eg: IP cameras and wireless access points) at wherever they are needed most, and redeploy easily if required. Because PoE utilizes a relatively low voltage, it presents low risks of electrical hazards. 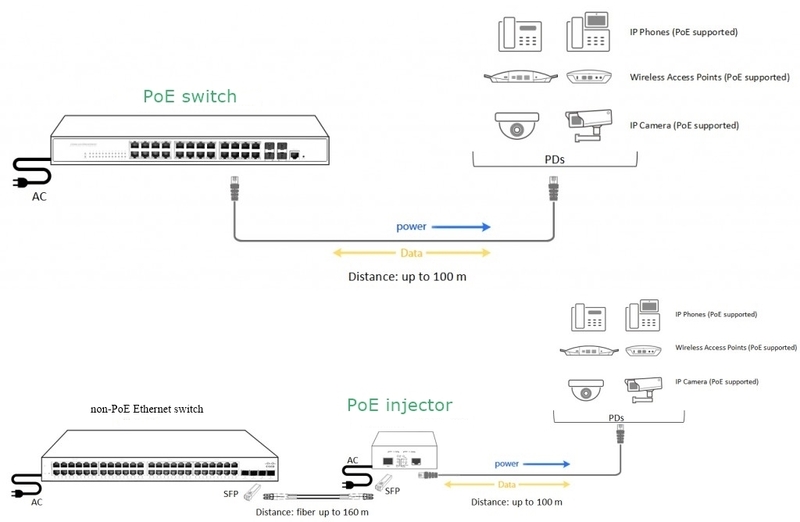 PoE makes it simple to add new equipment to a network. What is a PoE Switch Used for? 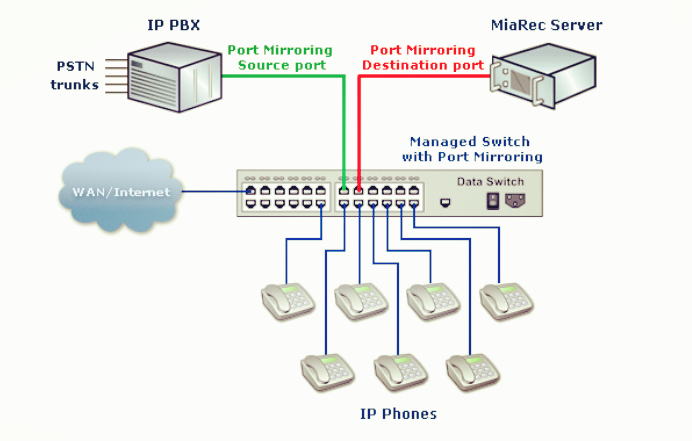 A POE switch is a network switch that has a built-in PoE injection. It can connect other network devices as normal, and the switch will detect whether they are PoE-compatible and enable power automatically. PoE switches are available to suit all applications, ranging from low-cost unmanaged edge switches with a few ports, to complex multi-port rack-mounted units with sophisticated management. 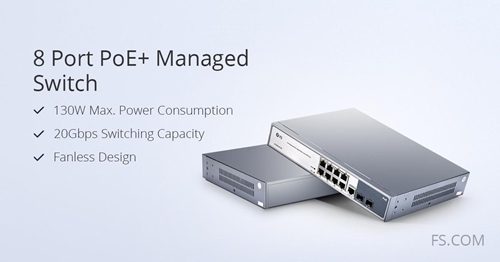 They can run PoE up to 100 meters from the switch or hub to the NIC, regardless of where the power is injected. The limitation is not the power, it’s the Ethernet cabling standards that limit the total length of cabling to 100 meters. FS.COM provides fully managed PoE switch, which are available with 8, 24 or 48 PoE Gigabit Ethernet ports of auto-sensing IEEE 802.3af/at. The PoE Switches are ideal for small business networks that need to inexpensively use PoE to deploy wireless access points and IP-based network surveillance cameras. They deliver robust performance and intelligent switching for growing networks, so PoE switches will be a best choice to install and manage your devices. The model details of FS’s PoE switches are listed below. How to Ensure Successful PoE Deployments? According to the IEEE 802.3af standard, the powered remote device can draw up to 12.95 watts of power. Considering the loss of the cable length, the power sourcing equipment (PSE) must have the ability to provide 15.4 watts of power to each port. For example, a 24-port Ethernet switch needs approximately 370 watts of power to supply the necessary power to each port. The PoE switches should have in excess of 370 watts available in view of the size of the power supply used in each device. It depends on how much power their switching functions require. Connect the critical power-sourcing devices to an uninterruptible power supply, and use devices with dual redundant power supplies to ensure that your critical devices never lose power. Carefully read the technical documentation and contact the technical-support number to determine compatibility. Failure to do so will leave you frustrated and will cost you time and money. Pay close attention to the manufacturer’s specifications and look for Cat5e and Cat6a compliance. Also, you should remember per TIA standards, only four connectors can exist between the switch or hub and the network interface card (NIC). A midspan device should be counted and treated as one of these connection points. The business motivation behind deploying IP-based technologies like WiFi and VoIP is to decrease networking costs. A significant benefit of PoE is that it runs on your existing infrastructure. PoE is a recently-developed technology, and it simplifies the enterprise deployment with lower operating expense, higher availability, and faster deployment. FS has provided PoE switches in a variety of specifications, such as 8 port poe switch, 24 port poe switch and 48 port poe switch, which may make your trip as comfortable as possible. For more information, please welcome to www.fs.com.